The Football League is starting to take shape after the third weekend of the season with just one team now having a 100% record. Wonder goals, dream goals, namesakes, no more "Mr Nice Guy" and perfect performers: BBC Sport has picked out a few of the day's main talking points, results and tweets from the three divisions for your delectation. Twenty years to the week since THAT goal from Tony Yeboah against Liverpool for Leeds United there were shades of that stunning effort by Sheffield Wednesday's Marco Matias. His first-half volley is already a goal of the season contender, with the wonder strike flying in off the crossbar as Wednesday drew with Leeds in the Championship's early kick off. Understandably Matias was trending on Twitter for several hours after he had scored the opener at Elland Road. The Portuguese player himself hailed it the best goal of his career. "I'm really happy to score this amazing goal," Matias told BBC Radio Sheffield. "I've scored a lot of goals in my career, I scored a similar one last season, but this is the best." Rochdale drew with Chesterfield with both clubs on seven points in League One. As a kid Billy Sharp dreamed of playing at Bramall Lane. Now in his third spell with Sheffield United, he scored an emotional first goal since his recent return in front of his beloved Kop as the Blades beat Blackpool to move up to fourth in League One. Sharp, 29, started his career with Sheffield United and joined Scunthorpe in 2005 before rejoining the Blades in 2007, scoring 13 goals in 64 appearances during that second spell. Six clubs later and Sheffield United fans will be hoping his return can help inspire them to promotion this season. "I'm relieved and delighted that I've managed to get off the mark and to do it at the Kop end," Sharp told BBC Radio Sheffield. "Last time I was here, I didn't realise what I was doing, this time I'm going to savour the goals a lot more. That one meant a lot as it was my first. "I'm a Sheffield United fan, I'm playing for the club I support and it is a dream. The lads were giving me stick for kissing the badge but that's what it means to me. My dad used to bring me here and watch United and I used to celebrate goals and go wild, and it was no different today." Going into Saturday's game, Stevenage manager Teddy Sheringham said he may ditch "Mr Nice Guy" as he waited for his first win in management. "Perhaps no more 'Mr Nice Guy' and enjoying the surroundings; maybe some home truths and sorting things out," he warned. Boro had lost three of their four games this season, and perhaps his players received the 'hair-dryer' treatment made famous by one of Sheringham's old managers - Sir Alex Ferguson - as the League Two side earned their first win of the season. His side defeated Hartlepool 2-0, whose 100% start was ended. "I know that wasn't a great performance, there is a lot more we can do out there and we will be working to improve," said the former England striker. "You have to grind out results sometimes and we did that today." 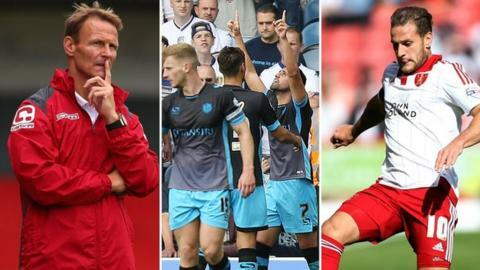 Only one team in the Football League's three divisions still boasts a perfect 100% record this season, and that is Leyton Orient. Their impressive start to the season continued with a 3-2 away victory at Newport County, after throwing away a 2-0 lead, as they moved two points clear at the top of League Two. "At half-time I said 'it's up to you now - you can go out there and fade and die or you can stand up and try and dig out a winner'," Orient manager Ian Hendon told BBC London 94.9.